I was sitting on the exam table when she said it, and I remember my head jerked as if hit with an actual blow. This was my new doctor, and my first physical under her care. I had just finished rambling through my family’s medical history, and with each added relative her eyes had widened slightly further. My mother, twice. My mother’s mother. My father’s mother. My father’s sister, twice. My mother’s father’s mother. My mother’s aunts, on both sides. My mother’s brother. My mother’s brother’s son. It grew everywhere on my family tree, that deadly fruit. Yes, I actually said that. And yes, I live in Canada, where the cost of my own healthcare doesn’t keep me up at night. I grimaced. She had me on civic duty. If there was one thing I knew, it was that I would one day inherit the legacy of breast cancer, and donating to science what I’d already decided was malformed genetic code was the least I could do. In January of 2011, I started blogging in guest posts on my friend’s blog (hi, Sandi!). Yes, we've backtracked; this was well before my doctor had suggested the referral. If you had asked me why I began blogging—even that tiny bit—I probably would’ve said something silly and spastic (it’s my reflexive response to anything, really, the need to be sarcastic and self-deprecating). I would probably have outed with some line about needing a place for the mental diarrhea to dribble before it dissolved my husband’s sanity. The truth is: it was for my kids. So they’d have an idea who their mother was. See, there’s not a whole lot left of my mother. She succumbed to her second battle with breast cancer in 2005, at the age of 55. 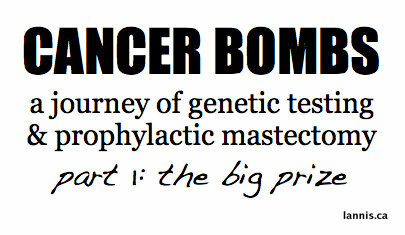 It was an entirely separate tumor from her first one, fourteen years earlier. She passed away eighteen days before my oldest child was born. Yes, she missed meeting her first grandchild by fewer than three weeks. Sure, there’s lots of her stuff (her favourite books, her cranberry glass collection, inherited jewelry, the rocking chair she used in her classroom—she was a teacher). But there’s not a lot of her left. I don’t have her voice recorded. I have no video of her. There are photos from when we were young, but she was usually behind the camera (welcome to my penchant for being in every second photo—I’m determined my children will know I am joyful, and will recognize all the shapes of my face, even the unflattering ones). But my children—her grandchildren—will never know how her mind worked; they’ll never know the paths her thoughts took to get to a given conclusion. But they will know mine. That’s where blogging comes in. I dubbed myself a writer when I was seven, and it’s the path I chose through my education. Elementary school, high school, and all the way through university, it has always been an aspect shaping my identity, regardless of how vocal I may have been about it at any given time. I don’t quite believe in god, but I believe there is an orchestrating force in our universe, and I believe things happen for a reason. I always knew I was a writer because I had a story to tell, but it has taken until now to garner a glimpse of what that tale would be. For a while I thought I was destined to write a story about a girl who stood, nine months pregnant, next to her mother’s casket. But then again, I never truly wore that label, regardless of its autobiographical truth. Sure, it fit, but not comfortably, as I don’t have the intestinal fortitude for wallowing. I was taught (by my mother) to refrain from throwing what she dubbed "pity parties." Her own mother had languished through ten years of cancer mixed with possible radiation poisoning, until finally succumbing at the age of 46, when my mother herself was only nineteen. When my mother was diagnosed with her first round of breast cancer at the age of 41 (she beat it through a partial mastectomy and radiation), she had been sure it was the beginning of the end. She had never expected to survive. The message she left with us was to always remember that she had been blessed with almost fifteen extra years. Choose to see the good. Regardless of what life was handing her—which admittedly was a tumor that ate its way through her breast, then decided to gnaw on her liver, lungs, and brain—she still felt blessed. She’d seen my sister and myself graduate from post-secondary. She’d seen my husband and I marry. She got to see her daughter's belly round with pregnancy. Our family had gone to Europe together—granted, not until after she’d been diagnosed terminally ill, but still, it was the trip of a lifetime, and she’d met the pen pal she’d had as a Girl Guide from the age of ten. The thing is, my mother’s wish was to know her children as adults—something her own mother never had the chance to do. And she did. My wish, after watching her waste away days before my son was born, is to meet my grandkids. I could extrapolate. Grandmother was 46. Mother was 55. By my math that meant I had until I was 64 (maybe), and likely the last handful of those years wouldn't be very livable. Months before that physical and my new doctor’s world-rocking announcement in May 2011, I felt myself rattled by midlife crisis. Mostly self-doubt and questioning. Of grand and grandiose proportions, to be sure, but I’d been left with the urge to live as fully as possible. Welcome the garden where morbid humour blooms. But this? This is all backstory. Because the last two years have been... enlightening. I know now what story I was to tell. I’m supposed to write it, and put it out there on the Internet, because I can, and because someone out there needs to read it. And I apologize, because it’s taken me this long to gather my thoughts in the wake of it all. Excellent blog Leslie! You are such a beautifully brave, smart, talented young woman. Thank you for sharing. Looking forward to more.